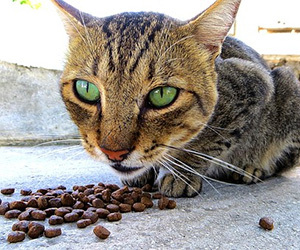 Why Does My Pet… Make a Mess When She Eats? Dogs and cats are typically considered neat eaters. Unlike many other small mammals and some birds, for example, our canine and feline house pets tend toward the tidy. Unfortunately, however, that’s not always the case. A few dogs and cats simply seem sloppy by nature. When they eat or drink, food may drop out of their mouths. Drool-laced water may slobber up the floor. In these cases, the area around their food and water bowls might just seem like a wild animal made its way into your home. Sadly, messy eating is not always benign. Dogs and cats with breed-specific issues related to facial conformation (think Pugs and Persians) are especially predisposed to physical problems that prevent them from getting food in their mouths and keeping it in there long enough to chew it properly. Due to other underlying medication conditions, cats and dogs may be unable to swallow normally without coughing, gagging or regurgitating food and/or water. Others may chew but the food will fall out of their mouths as they do so. Overtly painful eating might even be identified when pets begin to develop a love-hate relationship with their bowls. They want to consume the contents but they’ll sit in front of their bowls until they’re profoundly hungry or thirsty before eating or drinking –– often messily. Some pets may eat very little, chew more slowly or swallow food without chewing, leaving no mess at all. In other cases, they’ll drink or eat immediately before walking around and licking their lips, making repeated passes at their food and water before getting their fill. In this case, resource anxiety may play a role. This anxiety may have an underlying genetic component, or it may be exacerbated by experiences. The behavior may also be influenced by the environment where the food and water bowls are located, as well as the people and pets that are nearby. Other pets may play in their food and water bowls, gleefully pawing or snouting the stuff about. Although this could be a form of instinctive cache behavior (an attempt to hide food and save it for later), it may also simply be a form of benign entertainment for your pet. Whatever the case, whether it seems natural or abnormal, sloppy eating or drinking should always be brought to a veterinarian’s attention. This becomes especially crucial should the issue come on suddenly or become progressive in nature. Your veterinarian can help determine if there’s a medical or behavioral cause that needs attention or if it’s simply one of your pet’s adorable quirks.